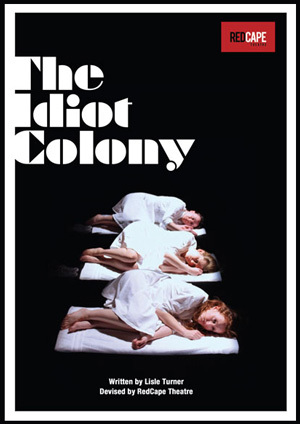 Our debut, The Idiot Colony established a strong reputation for producing high quality, original devised physical theatre based on extensive research of real life stories. After months of research and investigation RedCape Theatre uncovered many true stories of women committed to mental institutions during the 1940s and 1950s and used these stories to create the three characters and their back story for The Idiot Colony. The Idiot Colony was created with the support of South Street, Berkshire Venues Consortium and Arts Council England Southeast. RedCape Theatre premiered it at The Edinburgh Fringe 2008, where it won a Scotsman Fringe First and the Total Theatre Award for best Visual Theatre; it was also a finalist for the Amnesty International Freedom of Expression Award, The Carol Tambor Best of Edinburgh Award and the Holden Street Theatres Adelaide Award. The Idiot Colony was invited to be part of the London International Mime Festival January 2009 where it had a four night sold-out run at the ICA. This was followed by a national tour, supported by ACE East.